As the summer winds down and we move into fall, your yard is going to need some special attention before the cold weather hits. To help your grass thrive all winter and emerge healthy and vibrant in spring, there are a few actions you need to take this fall. The Lawn Care Experts at Giroud explain 4 Steps for Fall to have a beautiful lawn next year. These include aeration, seeding, fertilization and testing the soil pH. Seeding: Bare, thin and shaded areas need seeding. Also, lawns with disease or drought issues can be improved by over-seeding with newer, more disease and drought resistant grass varieties. Seeding in the Fall promotes strong root growth, better seed germination and less competition from weeds and crabgrass. Soil pH Test Balanced soil pH is essential to a healthy lawn. A simple pH test will show if the lawn is out of balance. Most lawns in the Philadelphia region are too acidic. Adding lime will reduce acidity and enable the grass to better absorb nutrients. A pH Test is a simple process! Rob Nagy, ISA Certified Giroud Arborist, explains in this YouTube video how to measure pH in the soil and what to do if it’s not balanced. Giroud measures pH at least once a year for our lawn care customers. If it’s out of line, Fall is a great time to fix it. Why is Fall the Best Time to Fix Lawn Problems? While figuring out the best actions to take will depend on the condition of the lawn, now through late fall, depending on the weather, is the best time to fix lawn problems. Moderate daytime temperatures and cooler nights in the Fall give homeowners the best chance for success and a beautiful lawn next spring! Your soil and grass will respond more favorably to these lawn fixes in the fall weather! Does your lawn need help? Your Giroud Lawn Service Professional will be happy to do a FREE Evaluation! Now is the time to prepare your lawn for a healthy and beautiful year! 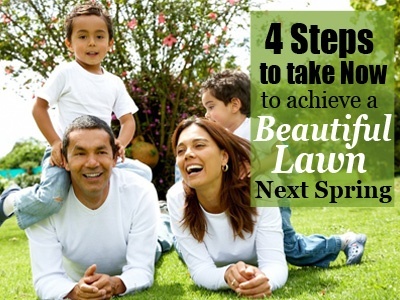 4 Steps to Take Now to Achieve a Beautiful Lawn Next Year Overall rating:	4.8 out of 5 based on 2621 reviews.